Charles Nichol Smith, Jr. (Nick) was born November 16, 1943, in Sedalia, MO, and passed away November 29, 2018, at Liberty Hospital. Nick was preceded in death by his parents, Charles N. Smith, Sr. and Mary V. (May) Smith, and daughter, Jennifer Smith Carr. He leaves his wife, Diana (Krause) Smith, son, Jeffery A. Smith and daughter-in-law, Dana (Stewart) Smith. He also leaves cousins, nephews, nieces and his beloved Aunt Renie (Irene E. Homan). Nick and Diana were united in marriage on June 30, 1968, and recently celebrated 50 years of marriage. Nick graduated from North Kansas City High School. He had a 35-year career with the Kansas City Southern Railway, retiring as Chief Engineer and Project Supervisor. Following retirement, Nick volunteered with the Wynbrick Homes Association, Habitat for Humanity, and was a member of Liberty Lions Club. Nick was an Eagle Scout and member of the Tribe of Mic-O-Say. 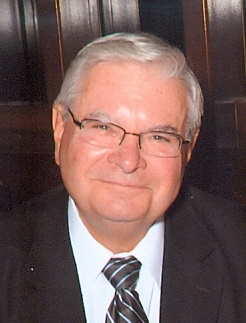 He was an active member of St. Stephen Lutheran Church, serving as an elder and usher. Visitation will be held from 5-8 pm Thursday, December 6, at St. Stephen Lutheran Church, 205 North Forest, Liberty. A service celebrating Nick's life will be held at 10:00 am Friday, December 7, at the church. Burial will follow in Glenridge Cemetery. The family requests no flowers and suggests memorials to a scholarship fund at St. Stephen Lutheran Church which will be established to send youth to National conference in the summer, 2019. You may share a message with the family or sign an on-line guest book via www.parklawnfunerals.com. Arrangements: Park Lawn Northland Chapel (816) 781-8228. Visitation will be held from 5-8 pm Thursday, December 6, at St. Stephen Lutheran Church, 205 North Forest, Liberty. A service celebrating Nick’s life will be held at 10:00 am Friday, December 7, at the church. Burial will follow in Glenridge Cemetery. The family requests no flowers and suggests memorials to a scholarship fund at St. Stephen Lutheran Church which will be established to send youth to National conference in the summer, 2019. Diana and family, We send our sympathy in the passing of Nick. May you find comfort through family and friends sharing Nick's life thru the pictures, stories and memories. Nick, never truer words were spoken than those shared by you when we spoke earlier this month. "Never go it alone, Give it up to God - He's the Chief Engineer and He has the plans. . . times may be rough, but things will and do get better if you trust in Him." I will never forget your willingness to help and care for others. While your loss weighs heavily on my heart, I know that you were prepared to follow God's new plans for your future. We will always love you . . . and I have fond memories of your wry humor and witty remarks. Nick was a great guy and will be missed by all. I remember his friendliness and willingness to help others. Diana and Jeff, treasure your memories of Nick always. May your memories and your faith give youcomfort in the days ahead. You are in our thoughts and prayers. Wishing peace and comfort to the loved ones who remain to mourn a wonderful man. I'll always remember the time Nick (Jenny's dad) was telling me that Bob Evans restaurant would seat his and Diana's Bible study group in a corner. "Is that because you're so rowdy?" I asked. His quick reply was, "Well, it depends on what we're studying. If it's Revelations, we get really worked up!" Words are never enough at a time like this, but know that caring thoughts are with you. Diana and Jeff, I am so sorry for your loss. Your family has also shown me great kindness. I wish you all peace. May God wrap his Loving arms around you Diana, Jeff and all the family as you go through this time. May you find peace and comfort that only He can give. I met Nick in 2007 after moving to Liberty. I appreciate his kindness in including me in activities. I will always remember him as a fine gentleman. I will always remember his skills with mechanical and structural things. Diana, I am sorry we are not there to give you the hug and support you deserve. Diana & Jeff I am sorry to hear about Nick's passing. He was so kind and great person to be around. May you find peace and comfort during this difficult time. Diana, I did not know your husband, but know that you and your family will miss him dearly. I had planned to be st the memorial service this morning, but something came up at the last minute that plans had to be changed. Know that you are in my thoughts and prayers. Diana, We are so sorry for your loss. Nick was a special person to you, his children, and Aunt Renie. May the Lord give you strength and comfort in the days to come.